Herbed Crusted Tilapia was a game changer for me. Fish is good for you and our diets should include fish at least once a week. I know that. The thing is, all of my life I’ve lived on one end or the other of the Great Plains and now live smack in the middle. That’s where animals roam – Angus and Hereford cattle, Yorkshires and Berkshires (pigs and yes, Mr. Buffet’s “live” stock, too), even chickens, turkeys and ostrich, buffalo and deer. But fish . . . Fish came as breaded sticks in plastic bags. Or in a box frozen into a solid chunk that had to be defrosted, then the slick stuff was dunked in egg and crushed crackers. And ended up tasting pretty much like the already breaded and bagged fish. Nothing to write home about. 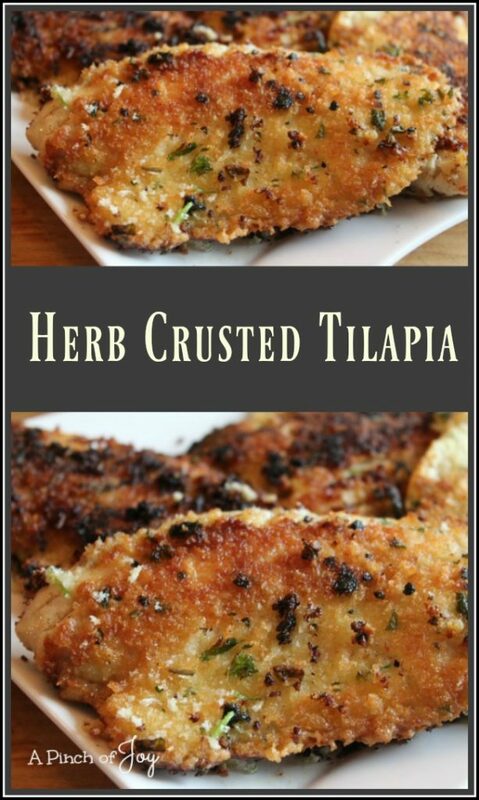 Herbed Crusted Tilapia is freshly crispy, with a gently herbed panko crust. It comes individually frozen in 4-6 ounce fillets before it is packaged so pieces are uniform enough to cook evenly. Use the fresh basil and parsley if you have it because it gives a wonderful taste and a delightful appearance. Dried basil and parsley can be substituted, but the bright green color and some of the fresh flavor will be missing. Use about 1 teaspoon of each instead of the 1 tablespoon of the fresh. I brown the fish and then continue cooking in the skillet over medium heat until done, 3 -4 minutes each side, depending on the thickness of the fillet. To me that is the quickest method and creates the fewest dirty dishes. However, you can also brown the panko crusted fish on each side and place under the broiler for about 6 minutes or until done. Either way, the internal temperature should be 145 F. or cooked until the fish flakes apart when tested with a fork. We all really like this. It’s good having more fish in the meal rotation!! A handsome fish dish, freshly crispy, with a gently herbed panko crust. If fish is frozen, defrost in refrigerator overnight before cooking. Measure flour into a third shallow dish. Put oil in large nonstick skillet over medium heat. While skillet is coming to temperature, sprinkle fillets with salt and pepper, Dredge each fillet in flour, then egg mixture, then in panko mixture. Cook fillets in oil for three to four minutes on each side or until browned and fish flakes easily when tested with a fork.